Monopoly Deal (card game) and Bop It for $1.00; that’s Bop It for $14 ($5 manufacturers coupon and a $3 Target coupon) with the free (Hasbro purchases over $10) Monopoly card game (and also using a $5 off Monopoly manufacturers coupon). Need 3 coupons total. 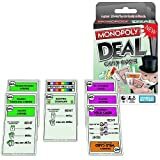 Connect 4 and Monopoly Deal (card game) for $2.00! That’s Connect 4 for $14 ($4 manufacturers coupon and a $3 Target coupon) with the free (Hasbro purchases over $10) Monopoly card game (using a $5 off Monopoly manufacturers coupon). Need 3 coupons total. So in essence, they’re paying you $5 to take the free Monopoly Deal card game (which is rated 5 stars at Amazon). Here’s a link to the coupons over at SlickDeals.net. Just so you know, you actually print these coupons come from Coupons.com and Target.com so they are legit and if you’ve never used either coupon site, they will want to install some kind of coupon printer application (for your Macintosh or Windows PC). 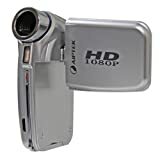 So the other day I purchased this Aiptek HD 720p Video Camera, I liked it but I saw it was on sale at this week so I went in to get the $30 price difference. Well, I couldn’t find the receipt so I went in to make sure it was the same camera first. It was not the same camera, it was the new better model, the Aiptek HD 1080p Video Camera, for $30 less. From the way it was on the rack I am pretty sure the old one was also on sale (i.e. clearance) since they didn’t have them any more and this one seemed to be replacing that one at the same price point. As I walked up to the counter I decided I didn’t want to bother to return the old one and buy the new one since the differences were minimal and there was a 15% restocking fee. I just wanted them to credit me the $30 for the old one. They couldn’t print me a new receipt, nor could they credit me the $30 without the receipt, but they would refund my money and they weren’t going to nick me the $30 if I purchased a new one, so I went back, got the better camera (which was even better than I thought) and got my $30 back too. From the receipt, it looks like they have the same SKU, so now I’m sure both were $30 cheaper. Sadly it was a waste of materials and money (they’ll send it back to the manufacturer) since they didn’t have a mechanism in place to credit me back the difference. But at least I made out on this one: better camera, $30 and a new receipt. http://GarySaid.com/tags/target/ generated Friday, April 19th 2019 at 3:06:29 pm EDT (in 84 queries in 0.620 seconds).